See what is included in the Duo ticket package price. 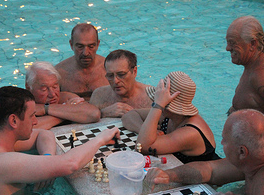 Szechenyi bath parties are every Saturday all summer, until the end of October, and then the venue may change for the Magic Bath parties in Lukacs Baths. 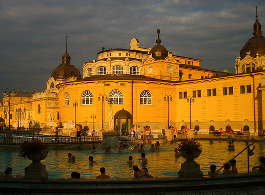 The only exception is the Dec 30 pre NY Party in Szechenyi Baths. Inclusions are enlisted on the payment page, check the current inclusions before purchase please. When you have chosen the date of the party, you will see a list of available ticket types. There is a letter i for information about each package. If you click on it, the list of inclusions will be revealed. Duo xpress ticket is a fast track entry. Skip the line if you buy an xpress ticket! You do not have to carry around a bulky towel for the party. Simply buy a Bonus Ticket with your friend, and get 2 sparty towels, which also make a great memory of the party whenever you take a plunge again. The towels come with a Sparty logo (spa party log0), and are are nice and pampering. Hi, I am not able to see the option to buy the bonus ticket for 30th Dec ? Can you suggest how to proceed ? Hello Kaps, sorry about that. 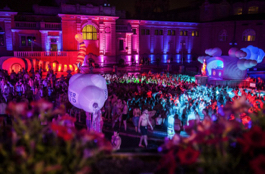 All Budapest NYE Bath Party bonus tickets have been sold out for the 2013 Dec 30 sparty, so now only plain bath party tickets can be bought (or group discount tickets). Hope you will still have a nice New Year’s Eve party and a happy New Year! Hello! I would like to know where I can buy the tickets for the New Yeas’s Bath Party. tickets for the New Year’s Party are not available online yet. Please check the website later for more information. Thank you for your understanding. 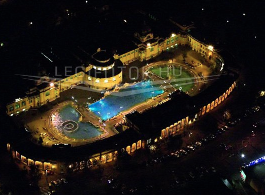 we have updated our party ticket sales page: now you can buy pre NY party tickets in Szechenyi Baths and enjoy a great night on the eve of Dec 30 in Budapest: http://szechenyispabaths.com/szechenyi-baths-new-year-bath-party/. Note: the pre NYE party is on Dec 30, as it is a pre party, not a Dec 31 party. Hi! Me and five of my friends are planning to buy the tickets to the bath party on 26 March. However it’s all sold out. Is there any other way that we could purchase the tickets. As we are traveling from Switzerland and would not want to miss the opportunity to have a memorable night in Budapest ! – cabin – private cabin for storage and getting changed. I’m afraid the other option is to go to the main entrance and see if there is anyone trying to resell a ticket for the pool party. 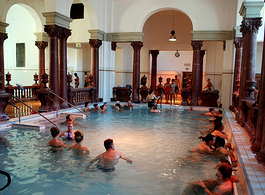 we are 4 people visiting the bath party on 11th june. I have purchased 2 duo tickets under my name. Just want to confirm the name does not matter and all the four of us can get entry? 2 Duo Tickets are for 4 people, does not matter if there is only 1 name on it, as you have purchased all of them. Please note, only printed tickets are accepted. If you buy several tickets, you will need to print them all. Please bring your ID with your tickets.